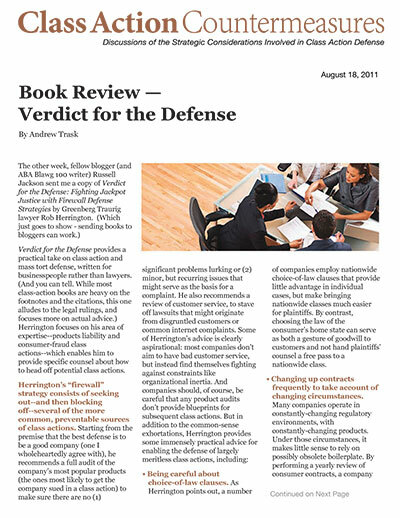 Verdict for the Defense provides a practical take on class action and mass tort defense, written for businesspeople rather than lawyers. (And you can tell. While most class-action books are heavy on the footnotes and the citations, this one alludes to the legal rulings, and focuses more on actual advice.) Herrington focuses on his area of expertise--products liability and consumer-fraud class actions--which enables him to provide specific counsel about how to head off potential class actions. Being careful about choice-of-law clauses. As Herrington points out, a number of companies employ nationwide choice-of-law clauses that provide little advantage in individual cases, but make bringing nationwide classes much easier for plaintiffs. By contrast, choosing the law of the consumer's home state can serve as both a gesture of goodwill to customers and not hand plaintiffs' counsel a free pass to a nationwide class. Changing up contracts frequently to take account of changing circumstances. Many companies operate in constantly-changing regulatory environments, with constantly-changing products. Under those circumstances, it makes little sense to rely on possibly obsolete boilerplate. By performing a yearly review of consumer contracts, a company can make sure that it catches any glitches earlier rather than later, limiting its exposure over time. Writing attractive arbitration provisions. While the Supreme Court's Concepcion opinion clearly establishes a preference for arbitration, it never hurts to make sure that the arbitration procedure is one that truly aggrieved customers would actually want to use. Adding "more than compliant" advertisements into a rotation if some ads appear vulnerable. Given some of the fraud theories out there, there is clearly no way to lawyer-proof advertisements. But, should an ad appear to be an attractive nuisance for the plaintiffs' bar, it may not require a complete overhaul of a sound advertising campaign. It is possible to make incremental shifts to reduce risk by adding advertisements that disclose even more information. So, can defense lawyers get anything out of this? Yes. Leaving aside Herrington's advice on litigating class actions (which, while sound, is probably a little low in citations for lawyers), it provides good insight into what a conscientious client will be thinking. More importantly, Verdict for the Defense helps identify what the best practices should be among clients. And that should help class-action defense lawyers act more like trusted advisors than hired guns.